Hello and welcome to exampundit. And it is final. 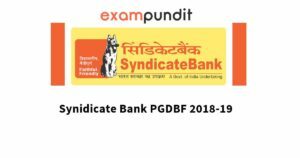 Syndicate Bank has released the notification of Syndicate Bank PGDBF Recruitment 2018-19 with 500 Vacancies. The selected students will be inducted to Manipal Global Education Services Pvt Ltd, Bangalore (MaGE) and Nitte Education International Pvt Ltd.(NEIPL), Greater Noida/ Mangaluru through this current selection exercise for 2018-19.The intake of students in each batch will be decided by the Bank, as per requirement. Degree (Graduation) with minimum 60% (55% for SC/ST/PWD) marks in any discipline from a recognized University OR any equivalent qualification recognized as such by Central Government. All the educational qualifications mentioned should be from a University/ Institution/ Board recognised by Govt. Of India/ approved by Govt. Regulatory Bodies and the final result should have been declared on or before 30.09.2017. Proper document from Board / University for having declared the result on or before 30.09.2017 has to be submitted at the time of interview.